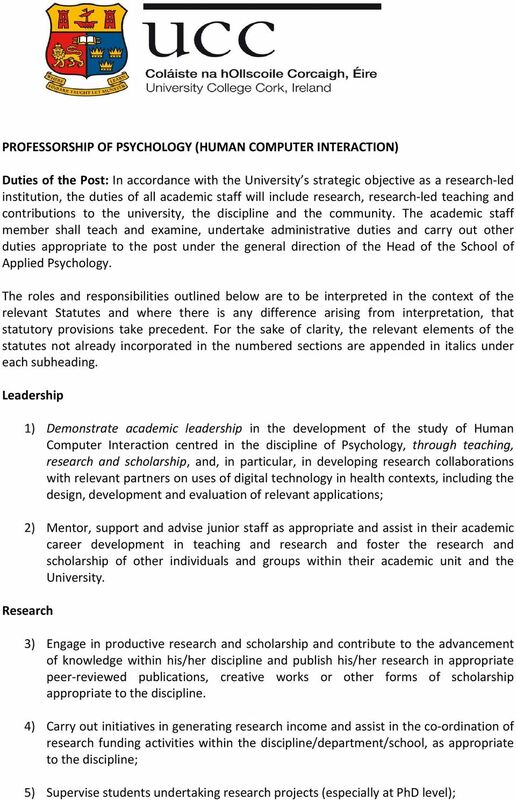 Download "PROFESSORSHIP OF PSYCHOLOGY (HUMAN COMPUTER INTERACTION)"
2 6) Engage in other scholarly activities relevant to the discipline. Teaching & Examining 7) Promote excellence in teaching and learning and encourage the application of innovative teaching and learning methodologies within the School of Applied Psychology and within other academic units in the University, as appropriate; 8) Teach and examine on courses at undergraduate and postgraduate level and, where appropriate, adult and continuing education courses and make a distinguished personal contribution to teaching at all levels. 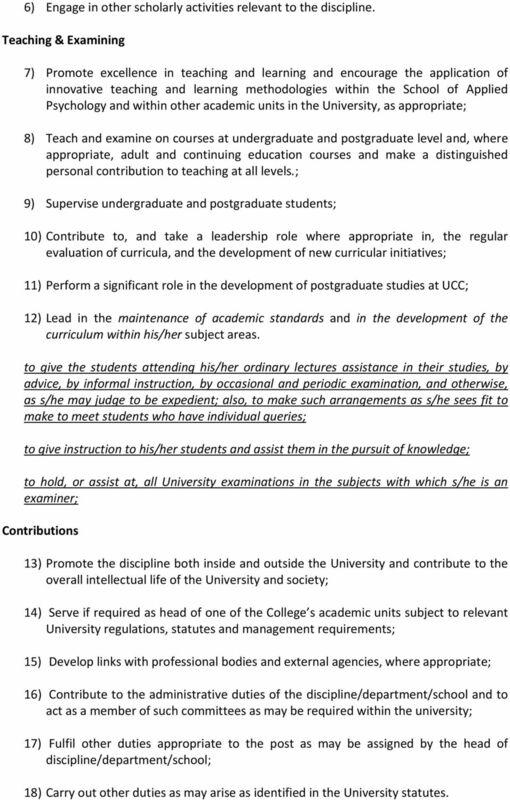 ; 9) Supervise undergraduate and postgraduate students; 10) Contribute to, and take a leadership role where appropriate in, the regular evaluation of curricula, and the development of new curricular initiatives; 11) Perform a significant role in the development of postgraduate studies at UCC; 12) Lead in the maintenance of academic standards and in the development of the curriculum within his/her subject areas. to give the students attending his/her ordinary lectures assistance in their studies, by advice, by informal instruction, by occasional and periodic examination, and otherwise, as s/he may judge to be expedient; also, to make such arrangements as s/he sees fit to make to meet students who have individual queries; to give instruction to his/her students and assist them in the pursuit of knowledge; to hold, or assist at, all University examinations in the subjects with which s/he is an examiner; Contributions 13) Promote the discipline both inside and outside the University and contribute to the overall intellectual life of the University and society; 14) Serve if required as head of one of the College s academic units subject to relevant University regulations, statutes and management requirements; 15) Develop links with professional bodies and external agencies, where appropriate; 16) Contribute to the administrative duties of the discipline/department/school and to act as a member of such committees as may be required within the university; 17) Fulfil other duties appropriate to the post as may be assigned by the head of discipline/department/school; 18) Carry out other duties as may arise as identified in the University statutes. 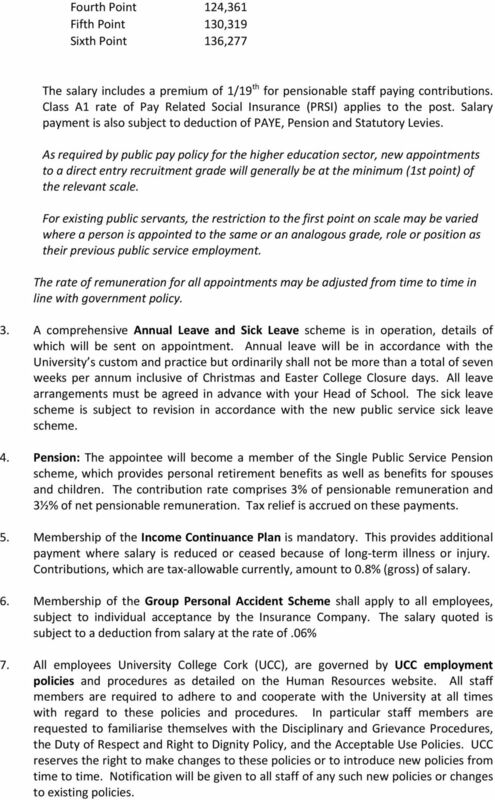 5 Fourth Point 124,361 Fifth Point 130,319 Sixth Point 136,277 The salary includes a premium of 1/19 th for pensionable staff paying contributions. Class A1 rate of Pay Related Social Insurance (PRSI) applies to the post. Salary payment is also subject to deduction of PAYE, Pension and Statutory Levies. As required by public pay policy for the higher education sector, new appointments to a direct entry recruitment grade will generally be at the minimum (1st point) of the relevant scale. For existing public servants, the restriction to the first point on scale may be varied where a person is appointed to the same or an analogous grade, role or position as their previous public service employment. The rate of remuneration for all appointments may be adjusted from time to time in line with government policy. 3. A comprehensive Annual Leave and Sick Leave scheme is in operation, details of which will be sent on appointment. Annual leave will be in accordance with the University s custom and practice but ordinarily shall not be more than a total of seven weeks per annum inclusive of Christmas and Easter College Closure days. All leave arrangements must be agreed in advance with your Head of School. The sick leave scheme is subject to revision in accordance with the new public service sick leave scheme. 4. Pension: The appointee will become a member of the Single Public Service Pension scheme, which provides personal retirement benefits as well as benefits for spouses and children. The contribution rate comprises 3% of pensionable remuneration and 3½% of net pensionable remuneration. Tax relief is accrued on these payments. 5. Membership of the Income Continuance Plan is mandatory. This provides additional payment where salary is reduced or ceased because of long term illness or injury. Contributions, which are tax allowable currently, amount to 0.8% (gross) of salary. 6. Membership of the Group Personal Accident Scheme shall apply to all employees, subject to individual acceptance by the Insurance Company. The salary quoted is subject to a deduction from salary at the rate of.06% 7. 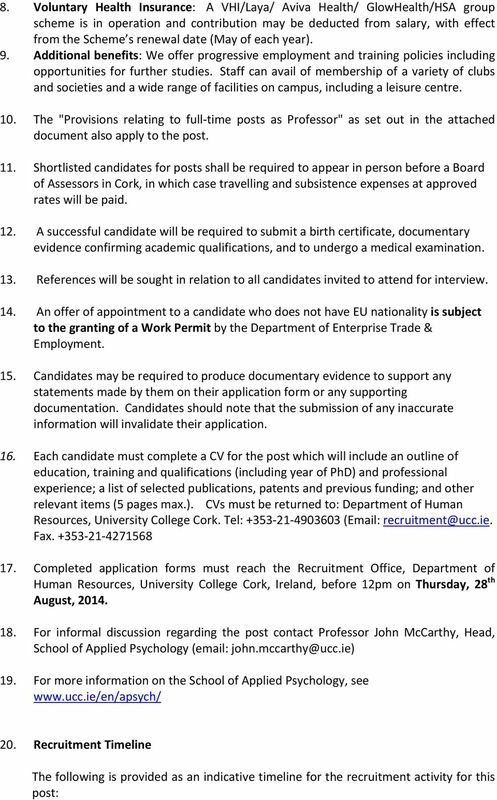 All employees University College Cork (UCC), are governed by UCC employment policies and procedures as detailed on the Human Resources website. All staff members are required to adhere to and cooperate with the University at all times with regard to these policies and procedures. In particular staff members are requested to familiarise themselves with the Disciplinary and Grievance Procedures, the Duty of Respect and Right to Dignity Policy, and the Acceptable Use Policies. UCC reserves the right to make changes to these policies or to introduce new policies from time to time. Notification will be given to all staff of any such new policies or changes to existing policies. JOB DESCRIPTION. 1. 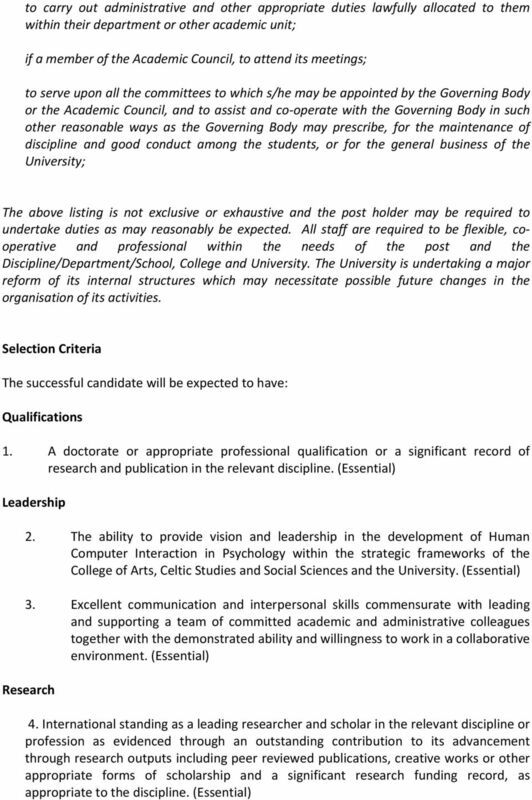 JOB TITLE: Senior Lecturer in Marketing and Public Relations. 4. DEPARTMENT: Warrington School of Management. JOB DESCRIPTION. 1. JOB TITLE: Lecturer in Spanish//Hispano-American Studies 2. HRMS REFERENCE NUMBER: HR14497 3. JOB DESCRIPTION 1. JOB TITLE: Lecturer in Computer Science 2. HRMS REFERENCE NUMBER: HR14194 3. ROLE CODE: FINSLTSR3 4. DEPARTMENT: Department of Computer Science Faculty of Science and Engineering 5. Applicants normally will have obtained their primary qualification not more than 10 years previously. ORDINANCE 16 PROFESSORS, READERS AND TEACHERS. 1 This Ordinance is made pursuant to Statutes 55 and 56. 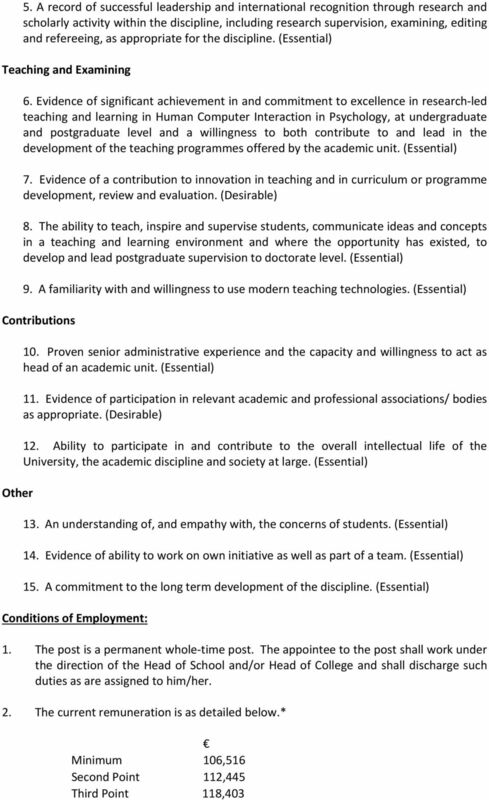 This post is intended to make a major contribution to the teaching, research and/or income-generating activity of the Faculty. Research Staff at CRM The purpose of this document is to define profiles of CRM researchers and to establish appointment guidelines. Typologies A. Visitors, Collaborators, and Distinguished Guests A.1. Vacancy for the Head of the Operational Support Centre (Grade AD 9) in the European Asylum Support Office (EASO) REF. Career Pathway: Successful completion of a 5 year probationary period leading to appointment to grade 9 Associate Professor.